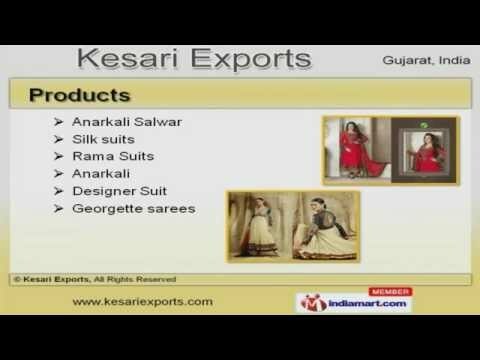 Welcome to Kesari Exports, Manufacturer and Exporter of Ladies, Sarees, Suits and Lehengas. The company was established in 2007 at Surat. UK, USA and New Zealand are some of our major markets. We are well known in the market for our Pro active customer service, Well ventilated warehousing unit, Unmatched designs and patterns. We present a rich collection of Anarkali Salwar, Rama Suits and Georgette Sarees. Anarkali Suits, Designer and Readymade Salwar Kameez are available in excellent designs and unique patterns. Our Patiala, Unstitched and Punjabi Suits are unmatched in terms of artistic excellence thus add glamour to the wearer. Our organization is highly involved in providing an impeccable range of Traditional Suits, Indian and Bollywood Replica Sarees. Lehenga Sarees, Silk Kurtis and Men¿¿¿s Sherwani are available with us at cost effective prices. Our Lehenga Choli, Patiala Suits for Party and Unstitched Suits for Boutiques are in huge demand across the global markets.